The blue State Flag of Pennsylvania depicts a shield bearing the state's coat of arms protected by an eagle and supported by two horses. 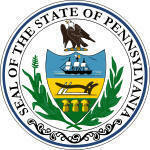 The shield features symbols representing the industries important to the economy of Pennsylvania. The flag serves as a symbol of honor, heritage and regional pride and is displayed at state buildings. There is a strict Order of Precedence for flags. State Flags are displayed in order as they entered the Union. Car Flags are often displayed to represent of an individual's allegiance to their state. Pennsylvania State car flags are used by their owners as mobile emblems of their home. Car flags are usually made from strong materials and are attached to a car via a pole and clip window attachment. What is the design of the Pennsylvania state flag? What do the horses symbolize? According to the ancient laws of heraldry the term 'Horses forcené' refers to the position of the horse when rearing or standing on his hind legs. This symbolizes readiness to serve country. What do the images on the flag represent? The red ribbon contains the words "Virtue, Liberty and Independence"
Who designed the Pennsylvania State Flag? The name of the designer of the coat of arms of Provincial Pennsylvania was Caleb Lownes of Philadelphia and the seal was designed by Pierre Eugene du Simitiere. What is the history of the Pennsylvania State Flag? 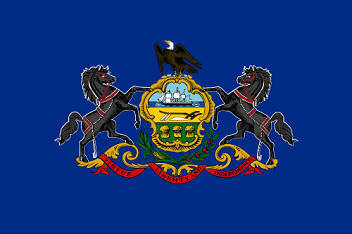 The Pennsylvania flag is kept and used as required by the code specified in the constitution of the state. Official Penn Nickname "Keystone State"